It’s been nearly a month since Google shut down their Reader service, leaving many users – including myself – in search of a suitable replacement. I’ve tested several, including Feedly, which feels most like a traditional newsreader. Then there’s News360, which presents news based on my social media activity. There’s the one that I’d never heard of before, but is fast becoming my favorite: SNATZ. SNATZ is a web app (Find it at: http://snatz.com), and it only delivers tech news. And, maybe because it’s so niche, SNATZ does things very well. 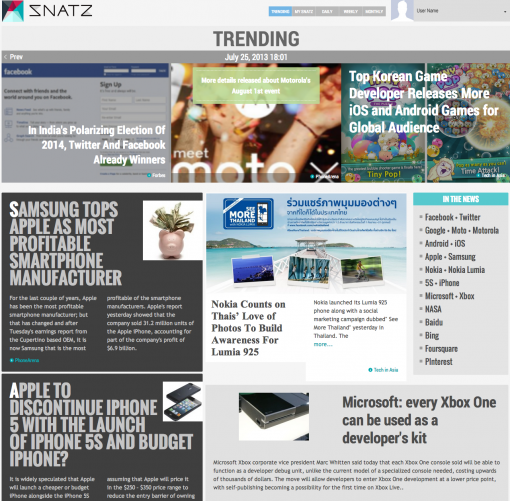 Anyone can read the top Trending news on their front page, but to really feel the power of SNATZ, one has to sign up for a (free) account, either by connecting to Facebook or Twitter, or uploading an exported RSS subscription file. I’ve found that it’s best to do all three, because the more SNATZ understands you, the more personalized the news you receive is. Once you’ve signed in, a new tab appears: MY SNATZ. And that’s where the magic’s begins. I’ve found that, unlike other services, what I’m presented here are items from lesser known news sources, giving me tech news not only from the usual suspects (such as The Verge, Forbes, and Buzzfeed), but from sites I’d never heard of before, such as mumbrella in Australia and Akihabara News. All this, apparently, is the result of their secret formula of complex calculations and complicated algorithms and analysis. To me, it’s simply the element of discovery – finding interesting news relevant to me – that has me hooked on SNATZ.